Berthold Lumat3 LB-9508 Tube Luminometer - Genetic Assay Water Quality . New Life Scientific, Inc.
Includes Laptop and Software - Tested! 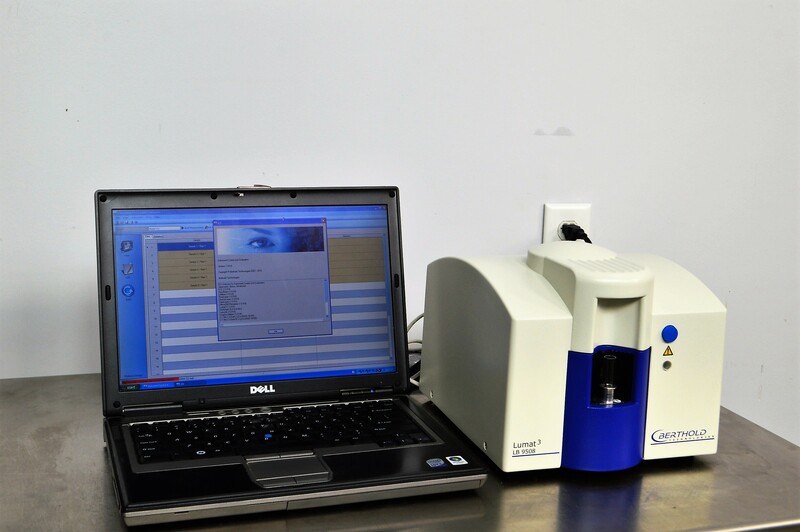 NLS acquired software and loaded in on a laptop with a fresh Windows install to test the Berthold Luminometer. The technician did not have consumables to use, but distilled and tap water served as samples. The trials produced repeatable results, but the technician was unable to confirm if the readouts were appropriate, lacking the reagents and precise knowledge to process the data points. The Berthold tube luminometer is in excellent cosmetic condition and demonstrated functionality. The technicians paired this instrument with a Dell laptop that includes a fresh install of Windows XP and Berthold's ICE controlling software. This luminometer is priced to sell quickly and convenient for labs and offices with limited space, boasting a compact footprint for your desktop.